The Uniform Anatomical Gift Act was revised in 2006 and most states have adopted it. Everyone who has not explicitly refused to be an organ donor is now considered a “prospective donor.” This means that, if you are “at or near death,” your hospital must notify an Organ Procurement Organization (OPO). While the OPO searches for a “reasonably available” family member or other person who can legally consent or refuse to donate your organs, the medical team can treat you like a donor, subjecting you to medical procedures—not beneficial to you—solely to make certain your organs are in tip-top condition for the potential recipient. Before organ transplantation was possible, physicians waited long enough to be certain that circulatory and respiratory functions had irreversibly ceased. Death was declared only when there were no vital signs—the body was cold, blue and stiff. Today, however, in the haste to procure vital organs before they begin to deteriorate due to loss of circulation, death is often declared to enable organ transplantation, not to protect the donor from a death-dealing mistake. Every state maintains an Organ Donor Registry listing people who have agreed to be organ donors, either on a driver’s license application or by signing an organ donor card. These state registries are readily accessed by Organ Procurement Organizations (a.k.a. Organ Donor Networks). However, NO STATE has a registry for those who do not want to be organ donors. Therefore, it is up to you to protect yourself. Refuse to be an organ donor IN WRITING. 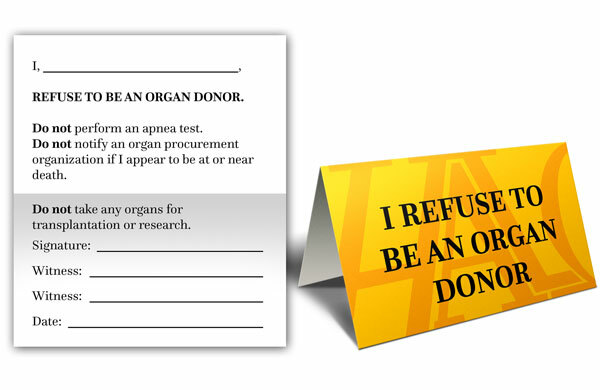 Sign and carry with you an I REFUSE TO BE AN ORGAN DONOR wallet card. To request a wallet card, email feedback@halorganization.com.